This post contains Amazon Affiliate links. If you choose to shop through these links, I will receive a small commission at no cost to you. Thanks for supporting the blog! We have a wild life enthusiast at home; a little girl who will run towards a bug (except bees and wasps because she learnt a bitter lesson that we don’t paint those guys) or any animal to further observe. I’m sure almost all the kids love animals. If you have one such kid you are shopping for, you can use this guide as a good starting point. This list is ideally suited for kids age 2-5 years. Any wild life loving explorer should have a magnifying glass on their everyday adventures to parks, nature walks or simply their backyard. It is fun to look at bugs and leaves up close and personal. This Melissa and Doug product comes in both “boy colors” and “girl colors”. My pre schooler has been using this product for the last 2 years. Where will your explorer store her nature walk finds? This is advertized as a bug box, but it doesn’t have to strictly be one. We have observed many bugs ( not the ones that are alive). More than anything else, this has served as our must-have for hikes and nature walks and has been a big part of many pretend play scenes ; usually a house for the animals. Kids binoculars just like the magnifying glass and bug box is a staple for little explorers both indoors and outdoors. How about after dinner backyard exploration? Your young explorers need a cool flashlight? This one will serve that purpose. 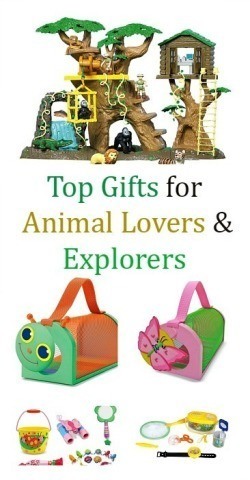 I would personally get this amazing kit for an animal loving explorer on your gift list. It has everything a young backyard explorer would need. Animal lovers and explorers love to care for the same animals too. This adorable set comes with everything your little veterinarian will need to take care of the animals. It also has a animals as pretend patients. Safari makes great pocket-friendly animal figures that can be used in numerous pretend play scenes. Combine with play dough, dirt, sand or throw them in a sensory box you will have child entertained for hours. The TOOBs come many in many themes : wild animals, farm animals, prehistoric animals, bugs. Does you kid group all his/her animals into little families? A tiger always has a mommy, daddy and a sibling? This would be perfect for an animal loving kid. Look how fun and gorgeous the play set! This is endless hours of animal play for your little people. If you are a DIY person, check out this amazing homemade tree house for the animals from Childhood 101. All animal loving kids should own at least one of these glorious Schleich animals. They are well-made, accurate high quality animal figurines which parents and kids will love at the first sight. Special Mention : Homemade gift for your explorer. For a comprehensive list of dinosaur gifts, please visit 3dinosaurs. Happy Holidays and hope these suggestions serve a base for all your gift shopping needs. Don’t forget to check out these great gift suggestions from my favorite blogs. Note: Post contains affiliate links which means if you happen to buy the toy by clicking through I’ll get a really minuscule dollar amount. Thanks so much for the mention! I love the Fisher-Price Kid-Tough Binoculars. Perfect for my rough & tumble Little Explorer. Happy holidays! Hope to see that outdoor toys post from you Debbie. What a great selection of animal related toys that all kids would love! What wonderful toys to play with!